I was raised by my grandmother. Back in the mid-60s, in St. Louis, Missouri, she toiled away at the florist’s shop to keep us all alive. My father drank a bit and was not very regular about his employment habits. Somehow that woman managed to keep us all fed and even sent us to Catholic school. My mother, who was very ill, left us. I was volunteered by my father to keep house for my family at the tender age of five. I can’t remember a day in my life when I wasn’t totally mesmerized by animals. I loved them and pleaded to have a puppy or kitten to love because I missed my mother so. Sadly, my grandmother had her fill from all the creatures my father had dragged home as a boy. So, I coaxed whatever sick or stray animal that would wander by the yard and closed the gate so it wouldn’t get loose. It would be all mine, for a day or two, until it figured out how to escape. And I would cry my heart out that it had left me just as my mother did. Easter time at the dime-store brought 100 little chicks, packed and stacked, in Chinese food cartons. They were all dyed in pastel blue, yellow, green, or pink. The store was alive with peeps. One quarter bought enough peeps to drive a city dweller insane in short order. And it did. I still can hear my father screaming through the peep-peep, peep, peep-peep-peep “Shut that gawd-durn bird up! How am I going to hear the TV?” My father would spend many evenings cussing that bird while waiting for the usual death that befalls all dime-store chicks. I spent those wishful nights, gleefully, downstairs with my new best friend, watching him race from one end of the toy box to the other, while he was looking for his new “mom” to pick him up. I named him Charlie. We were inseparable, Charlie and I. He ate what I ate (in addition to his chicken food), went where I went, and did what I did. The most difficult time for the little chick was when I’d go to school. He’d wait in the backyard all day. 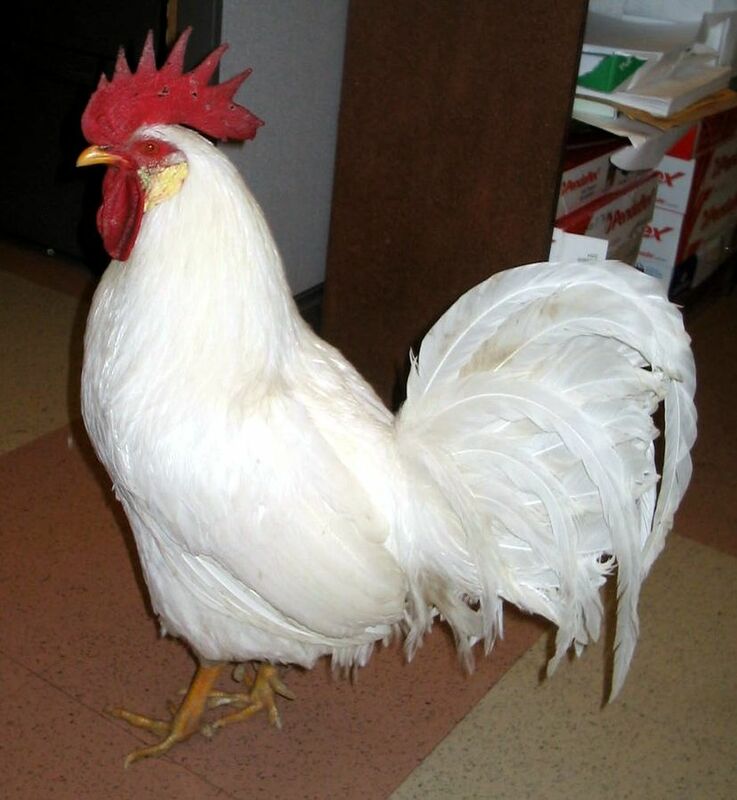 When I was a half a block from home, he could hear my whistle, then he’d take off running full speed ahead—chicken style: all his feathers slicked back, his neck and body stretched forward as far as he could stretch; each step would swing him left or right as he raced as fast as he could to greet me. That was his mode of airstream travel. When he reached me, he’d fly onto my shoulder and, all out of breath, he’d gasp little peeps while he tried to tell me all the trials of chicken life that day. And we’d mosey home that way. Spring melted into summer, and our weekly trips to the dime store continued. Those were the days of penny candy—big jars of penny candy. There were five rows of jars on the shelves stacked high enough to make us stand on tiptoe. There were no laws about animals being in stores then. Charlie sat in the crook of my arm, and I’d pick one piece of candy, and then I’d ask him which one he wanted. I’d wait, and when he jerked his head a couple of times at a certain jar that choice would be his. Always before returning home we’d stop at the Velvet Freeze for our ten-cent ice-cream bar to tide us over during the walk home. Fudgsicles were a favorite. I’d take a bite and Charlie would take a bite. With the jostling of walking, holding a chicken, the bags of candy, manipulating the ice-cream bar, chocolate would cover my mouth, his beak, and most of our faces. What a sight! When Charlie got older, I found a round box and secured it to the back of my bicycle, cut a hole in the top and voila! the chicken graduated to wheels. We could make the candy trip to the store in style. He was tightly secured in the box on the back of my bike. Sticking out of the hole in the top of the box was the white head of a leghorn rooster with long red waddles and a bright-red comb. As my legs pedaled, Charlie’s head kept rhythm: forward-back, forward-back, just like he was walking along in the yard. Every bump brought with it a “Brrraught” from the little backseat passenger as the two were off on their summertime adventures. We received a phone call from the neighborhood college in the fall. “Yes, we have a chicken.” “You want him for a play?” Oklahoma? Charlie was going to be a star! “Be at dress rehearsals at nine p.m.” We left Charlie backstage, and all was quiet. That was until he got on stage. He wouldn’t shut up. It was the scene with the traveling salesman, and he was holding Charlie in a cage. Every time the salesman spoke, Charlie thought an answer was required, and he did so–quite loudly. No one could hear the salesman’s lines. Charlie lost the audition and his only chance at being an actor. A few years went by, and Charlie was past his prime. He had taken on the personality of a dominant rooster and was chasing the little kids, walking home from school, and scaring them to death. My brother was home, one day, when a policeman knocked on the door. “We had a call to this address that there is a dangerous chicken here. Is that so?” My brother, not sure what to do with the comment of “dangerous chicken” said, “Well, we do have a chicken here.” He went outside and led the officer around to the backyard, opened the gate, and there was Charlie eager and ready for company. The officer took his stance, drew his gun, and pointed it at the bird. My brother was doing all he could to not burst out laughing at this ridiculous scene: the policeman vs. the “dangerous” chicken. I think my brother is still chuckling, forty years later, at that officer and his gun.Well, we had our warning. Charlie had to go—dangerous or not. We had to find a new home for him. My brother happened to work for a man who had a large spacious farm in the country with lots of hens that were eager for a boyfriend. That’s where Charlie lived happily, ever after. This entry was posted in POSTS, Unpublished Works, WRITING and tagged 1960's, chicks, children's fiction, children's stories, dime store, Missouri, nostalgia, peeps, St. Louis. Bookmark the permalink. Thanks for sharing this, I thoroughly enjoyed reading about Charlie and his adventures.